Specialising in the letting, investment and management of residential and commercial property. Established in 1995 Fastmove Lettings is based in Warrington and offers a residential and commercial property lettings and management service nationwide. We are a modern and up to the minute agency, with a mission to be honest and realistic with regard to all properties. Whether you are a tenant or landlord, we are able to provide an excellent personal and high standard of service; we feel your choice of property management is equally as important as your choice of solicitor or other professional body. Owners may let their property with the comfort and assurance that their major capital asset, which sometimes may be their family home is being managed in an efficient and effective way by a company who have been serving local property needs for over ten years. Warrington has seen a massive building programme over recent years which have included retail business parks and new residential estates & developments. It has become an increasingly popular area to live providing a wide variety of housing types. For the potential tenant, moving can be a busy and stressful time and Fastmove Lettings are here to ensure that the whole operation runs as smoothly and efficiently as possible by offering all the assistance you require. We pride ourselves on our personal and friendly service and feel that this plays a big part in our continued success, along with our highly motivated and trained team members, we are constantly looking at ways to improve our service. Proof of our excellent service is that a large proportion of our business is by referrals from satisfied clients who have recommended us to others and believe in giving value for money. Working with our in-house marketing team our aim is to simply get your property seen by as many potential customers as possible and get the quickest deal at the right price, expert local knowledge and negotiating skills all combine to provide a successful conclusion. Customer service has always been a key part to our success and we are dedicated to maintaining service standards of the highest quality. Our up to the minute computer matching system, digital photography, internet and media advertising, and access to the internet via www.rightmove.co.uk allows us to maintain an extremely quick and high standard of service, we're certain we have the right property to suit you and our extensive portfolio includes apartments, terraced homes, semi detached and detached homes, both new and traditional. We have property to suit all price requirements and cover the whole of the Warrington area and further a field. Our office staff is fully trained in all aspects of the business and includes a Business Manager, Marketing Advisor, Mortgage Consultant and Sales Negotiators. Any one of our staff members will be pleased to assist you with your enquiry. The policy of Fastmove Lettings is to continue to provide a truly personal, simple, straightforward service. Intensive staff training means that we have a strong customer care and sales focus with an excellent personal service. This is backed up by the very latest in computer technology, which gives our clients the presentation and coverage their homes deserve. Our staff training programme ensures that staff at all levels is kept fully informed of the developments and changes within the property business. Our system and services are constantly being reviewed and our aim is to continue to provide a first class professional service for many years to come. Fastmove Lettings also provides Financial Services and have no bank or building society ties and will arrange mortgage finance with any of the major lenders on your behalf, thereby ensuring that the client attains the most competitive mortgage and insurance terms. Our recently refurbished office is located in a prime position in the centre of Warrington. When you register your search criteria with us, we will keep you up to date with any new properties as soon as we receive them. 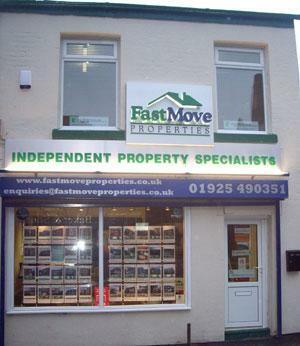 Whatever your requirements, you can rely on Fastmove Lettings to get you moving! So if this is the professional service you are looking for, then look no further, contact us either by telephone, e-mail or call in to see us, where our experienced team will be happy to help and advice on all aspects of moving home and home management. All our staff are fully qualified in all aspects of property management and lettings. As an independent agent our fees are tailor made to the property and deal.